See how top brands compare in consumer adjustable base reviews. Adjustable beds are quickly becoming popular among people seeking better sleep, and for good reason. The range of positions allow sleepers to tailor their bed to address specific concerns like swelling, acid reflux, back pain and more. This is why so many medical facilities rely on beds that can adjust, but their use is not just confined to hospitals, elderly, and ill individuals. Modern adjustable bases offer convenience, comfort and style as well. Many home adjustable beds blend into decor and feature luxurious extras like wireless controls and massage. An adjustable bed is more than a piece of furniture you sleep on. They provide an entirely new functionality and comfort. With customizable head and feet angles, you can comfortably work from your bed or watch movies play video games in the most relaxing position you can create while getting a rejuvenating massage. When you get an adjustable base, it often becomes a favorite place to be. 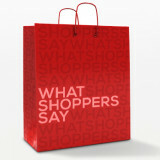 As with all products, there are many different brands that all claim to offer the best comfort or value. But, how do you know which is right for you? Key features to look at when comparing mechanical beds include warranty, price, functions, and opinions of other consumers. In this comparison, we will assess these key points and take a look at some adjustable frame reviews in an effort to provide an overview of the top brands available. 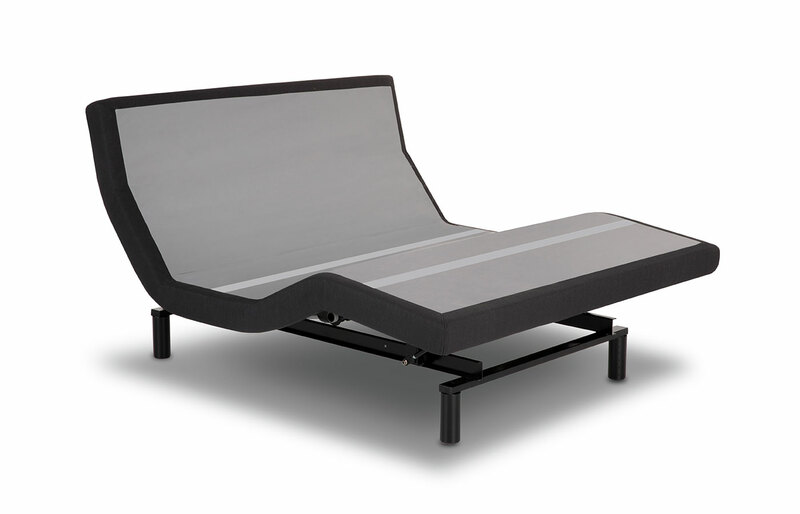 The Ergo Star Evolution from Astrabeds is a very popular adjustable bed with all of the most sought after features and several customization options. 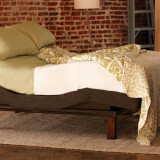 The head of the bed adjusts up to 60 degrees and the feet angle adjusts to 45 degrees. It features a space saving design that allows for compatibility with most bedroom furniture. The ergonomic wireless hand control offers variable wave massage control, zero gravity, TV setting, customizable settings and convenient backlighting. Control: Wireless; Includes Zero Gravity button, flat button, customizable position buttons, massage controls, and backlighting. The Ergo Star has the distinction of being one of the most reviewed adjustable bases online, with over 60 individual reviews on the retailer’s website alone. It has garnered a ranking of 4.6/5 stars with most reviewers saying they would recommend it to a friend. Reviews on Astrabeds are also third party verified, which means PowerReviews (an unaffiliated, well-known company) matches reviewer information to customer information, ensuring reviews are legitimate and real. The Ergo Star Evolution is available online from Astrabeds.com. 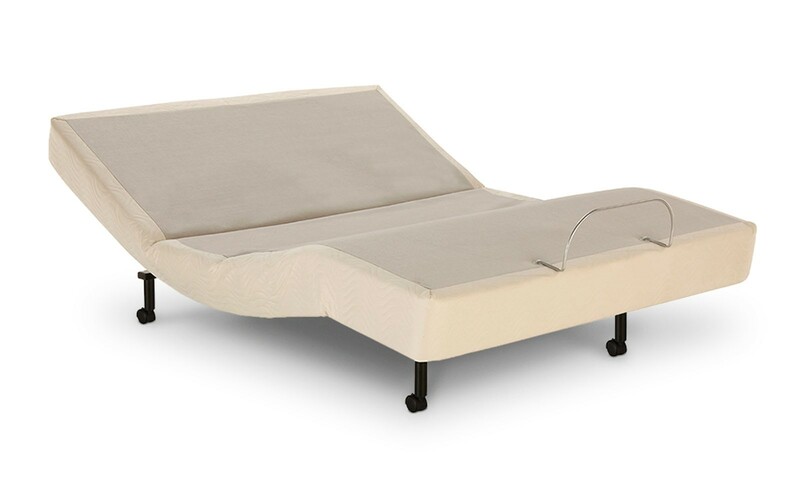 The Leggett & Platt Prodigy adjustable bed is one of the most advanced options on the market and is geared towards luxury shoppers. Offering a host of hi-tech features, it is sure to make your bedroom the best room in the house. From a snore stopping function to programmable position memory, the Prodigy has all of the latest bells and whistles. Users have a nearly endless amount of head and feet positions to choose from. Optional modules even allow users with iPhones and iPads to control the bed via an app. A gentle wake alarm feature uses light massage to rouse slumberers. Control: Wireless WiFi/iPhone connectivity; Includes memory buttons, flat button, massage controls, snore stop feature, alarm and backlighting. This is a relatively new base compared to peers, though initial reviews of the Prodigy adjustable base are largely positive. Customers list very few negative aspects of the product and overall experience. 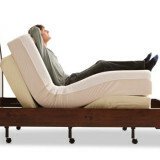 Of the available Prodigy adjustable bed reviews, average ratings come in between 4.9-5/5 stars. Reviews are verified by a third party to ensure legitimacy. . 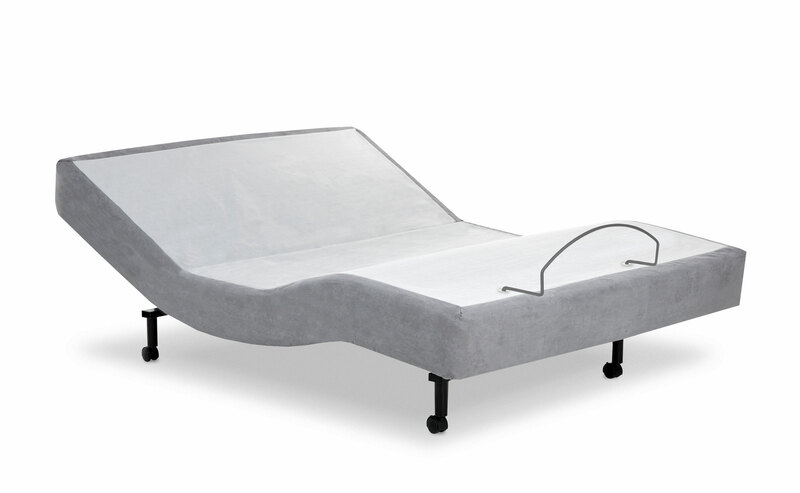 The Prodigy adjustable base is available online from retailers like Amerisleep, with primary differences to consider being retailer reputation, delivery options and pricing. Amerisleep’s Adjustable Bed base is a quality bed with all the features you expect to find in a version bed with some additional features. A 58 degree head angle with pillow tilt and a 44 degree foot angle are perfect for reading or watching your shows. The wireless, backlit remote features buttons for preset positions. It also links with a smart phone app. Variable wave massage settings for stress and tension relief. You may never want to leave your bed when you create and use customized positions to fit your preferences. Just one press of a button and the bed will return to a flat position. Control: Wireless; Includes Zero Gravity button, flat button, customizable positions buttons, massage controls, and backlighting. The reviews for this bed are very positive. Customers resoundingly praise the bed in their reviews giving between four and five stars. Several reviews mention being very pleased the white glove service, comfort and durability. Reviewers seem happy with the product and the price, even after several years of use. Amerisleep reviews are also verified via a third party organization. 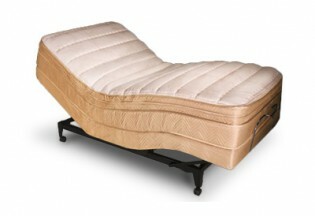 The Amerisleep Adjustable Bed is available online at Amerisleep.com. The Tempur-Ergo Premier adjustable system is targeted at luxury shoppers, commanding a premium price even without the Tempurpedic mattress. It features 70 degree head adjustment, rolling wave massage, and wall hugger design. This model has a wireless remote and is Apple iOS or Android device compatible. Control: Wireless; Includes flat button, programmable memory settings, massage controls, and backlighting. Application Options: Headboard brackets and variable leg heights. Reviews on Tempurpedic’s website for the Premier system average 4.6/5 stars and the majority of reviewers report satisfaction. While customers enjoy the ability to adjust the sleeping position and ease of use, those that dock stars cite value relative to other models and that the product didn’t meet their expectations. 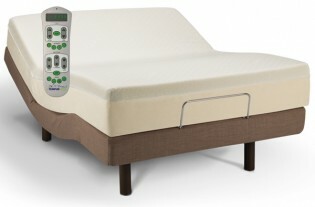 The Temper-Ergo Premier system is available through Tempurpedic’s website and some distributors. The EasyRest Premier adjustable bed, formerly the Contour Premier, was recently rebranded in an effort to give the company a new face. Unlike other brands listed here, they appear to require the inclusion of one of their three innerspring mattresses. The Premier model features wireless controls, massage, and casters on the legs. Control: Wireless; Includes flat preset, programmable memory, massage controls, and backlighting. Application Options: Headboard brackets and variable caster leg heights. The Contour line of adjustable bases was dogged with reviews of poor quality and even poorer customer service. Since changing to EasyRest, they’ve continued to rack up scores of 1-star reviews on third party sites (over 80% give less than 2 stars). Many of the adjustable bed reviews tout beds that break very early and customer service horror stories as the reason for their dissatisfaction. Not surprisingly, they offer no reviews on their website. The Premier adjustable base is available on the EasyRest website via phone. The table above is demonstrative of the amount of information you need to consider when looking for an adjustable bed. There are many more categories and features beyond those in the table, but these are some of the more important features. It can be overwhelming, which is why we created this review. Think about the features you need first, then consider the extras you may be able to afford. It’s easy to get caught up in all the neat new technologies. If you are looking into mechanical beds because you have health-related problems you’re hoping to alleviate, talk to your doctor before making a decision. Your doctor likely isn’t a sleep expert, but he or she will know your particular situation and can probably give you some ideas on things to look for or avoid. The last thing you want is a bed that won’t do anything for you. As mentioned earlier, adjustable beds are not just for those with health issues, though. People of all ages, sizes, and shapes own them. They can turn a bedroom used solely for sleeping into your favorite space, but you need to find the right one at a good value. A little research can go a long way in avoiding a costly mistake, especially when it comes to items like adjustable bases that cannot be easily returned. When you are spending hundreds or thousands on an investment in your health and happiness, it is well worth your time to check into the retailer and brand. While the best bed can be individually subjective, our research and comparisons of adjustable bed reviews point to the Astrabeds Ergo Star Evolution as one of the best options based on ratings, features and value. 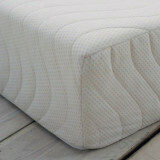 What is the consumers opinion/choice on the adjustable split mattress the pros & cons. There isn’t a ton of information on specific consumer opinion versus split or one piece models, but here would be the main pros and cons. Keep in mind if you’re looking at king size, most brands only sell it in a split version. Split Bases: Each person can adjust their side’s position and massage settings, helpful for couples who have different health needs, sleep schedules or comfort preferences. For example, you want to sit up and read, but your partner may want to sleep flat or put their feet up. A split base lets this happen. However, on some bases or mattresses, there could be a notable “gap” in the middle (mattresses without “pillow tops” like foam beds and bases that physically connect together minimize this) and split bases do tend to be more expensive. On the other hand, a split base can also usually operate as one unit (setting the controls via one remote) if you decide to use one mattress. Non-Split Bases: The main advantage here is that one-piece bases will not have any chance of gaps in the middle, regardless of mattress type, and a one-piece base tends to be less expensive than a split base. However, you and your partner must always agree on the position and settings. Some bases come with connectors to keep the two halves firmly attached, so use those if available. Make sure mattresses are pushed together and close to the retainer bars. If you have the two halves set up to operate in unison a fitted sheet or protector the covers both halves is definitely a good option. If they operate independently, using a non-slip pad (like those designed for rugs) between the mattress and base could help them stay in place better. Hope this helps! Almost all manufacturers have split king adjustable foundations, but many of them allow the two sides to be operated simultaneously with one remote if you wish to use a non-split mattress (by configuring the receivers to the same setting). Most will work this way, but double check with the manufacturers for the model/s you are considering. Thanks for reading!